Only those who fly fully appreciate the wonders that exist out the front of the cockpit. Our passion is fueled by the experiences of seeing and feeling many things, including the extraordinary cloud types that comprise our living atmosphere. “Rotors” of turbulent air that form in the lee of the escarpment just a few miles to the east of Perth Airport in Western Australia. Every Perth inhabitant who has flown has probably experienced this rough ride just prior to landing or after takeoff. Thunderstorm bashing up against the tropopause as we crossed the ITCZ over the Pacific Ocean on 24 December 2012. The above photo of a thunderstorm was taken during my crossing of the Pacific Ocean on my way from Melbourne, Australia to Los Angeles, USA. We departed LAX on the 24th December and landed in Melbourne on the 26th, so we enjoyed Christmas Day in-flight, watching out for and ready to avoid an unlicensed sleigh. We were flying through the Inter Tropic Convergence Zone (ITCZ), a corridor ringing the Earth that marks the most heated surface temperatures, that trails the sun’s highest position in latitude by one month. The warmer surface heats the air more than the surrounding cooler surfaces. Convective forces lift moist air mass in the ITCZ to form the highest and most spectacular thunderstorms on the planet. The water vapour causes the wet rising air to cool slower than the surrounding drier ambient air. This growing temperature difference causes the rising column to become even more buoyant in the atmosphere. 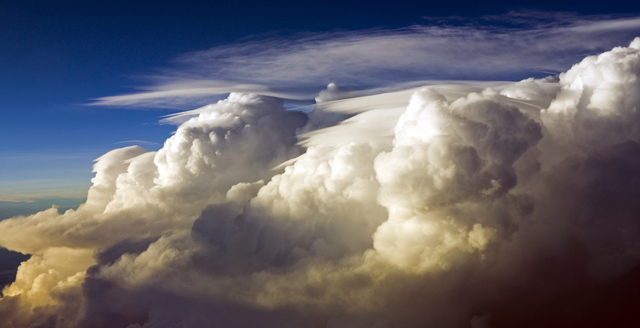 The buoyant thunderstorm clouds can often ascend at more than 5,000 feet per minute. The thunderstorm tops rise until the atmosphere becomes stable. 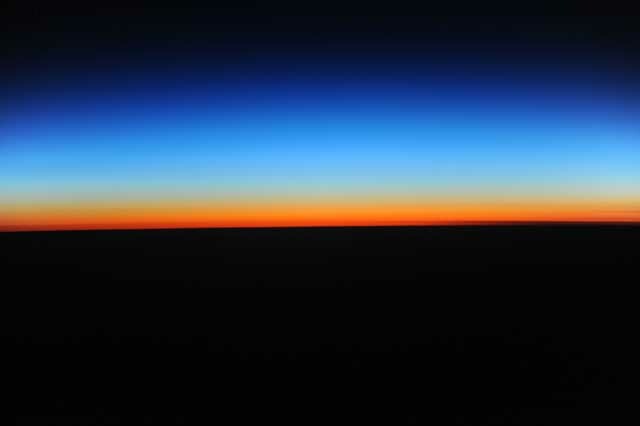 The highest stable altitude is found at a point called the Tropopause, where the air temperature remains constant as the altitude increases. The tropopause can be located anywhere from 25,000 (poles) up to 60,000 (equator) feet above the surface. Many ITCZ thunderstorms reach these amazing heights and then then “top out” at after punching though the tropopause. This is the reasons that the coldest atmospheric temperatures exist over the equator! Every pilot who flies through the ITCZ knows about these dangers and avoids thunderstorms accordingly. We are always on alert, aware that a “safe” radar picture one minute can change into a “dangerous” paint the next. We never fully trust the radar presentations. 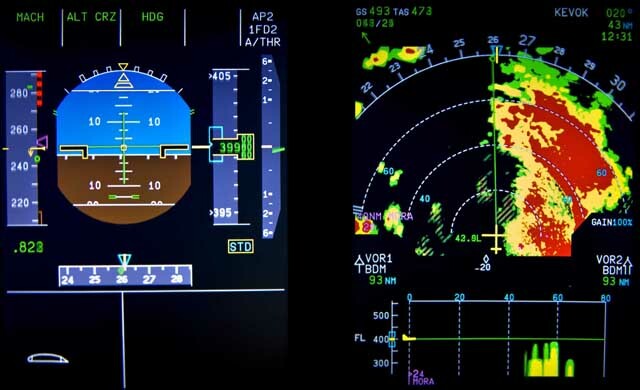 The pilots creed of “one look outside is worth 100 radar scans” holds true and at night. Whilst the passengers are snug in their seats watching the latest video, we have turned down the cockpit lighting to the minimum and pressed our faces against the windows, using the “Mark 1 Eyeball” to scan the outside horizon for dangerous storm cells. We were flying at 38,000 feet when I took the above picture of the ITCZ thunderstorm. You can see the top of the thunderstorm flatten out as it punches through the tropopause, its inertia pushing and penetrating the tops up into the calm troposphere. The rising air has lifted the bottom of the troposphere deforming the high, flat cirrus cloud to take on a “concave” or “Lenticular” type cloud form. The energy in this thunderstorm, if tapped, would have powered a city for a day. 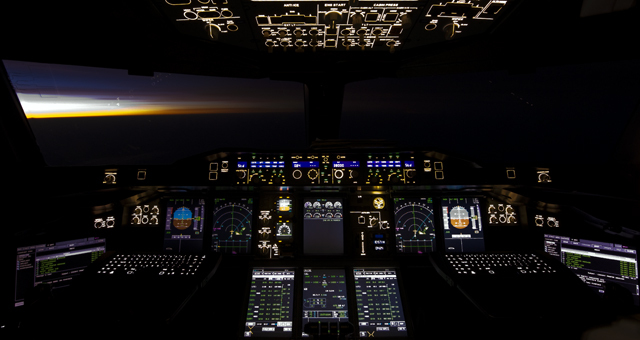 This is just another day in the life of an airline pilot. Our 400 passengers were either asleep in the A380’s remarkably quiet cabin, or watching one of the thousand in-flight movies. Whilst they relaxed with their window shutters closed, we dodged one ITCZ thunderstorm after another, banking and weaving, banking and weaving through the sky, all the time ensuring that the aircraft rolled at a rate less than three degrees per second – a rate that is undetectable to our passengers. We were busy in the flight deck whilst the passengers presumed that their pilots were carving a straight line through clear skies. Not a drop was spilled from any glass. Below is an excellent photo taken by Witta Priester and displayed on NASA’s apod.nasa.gov/apod website. 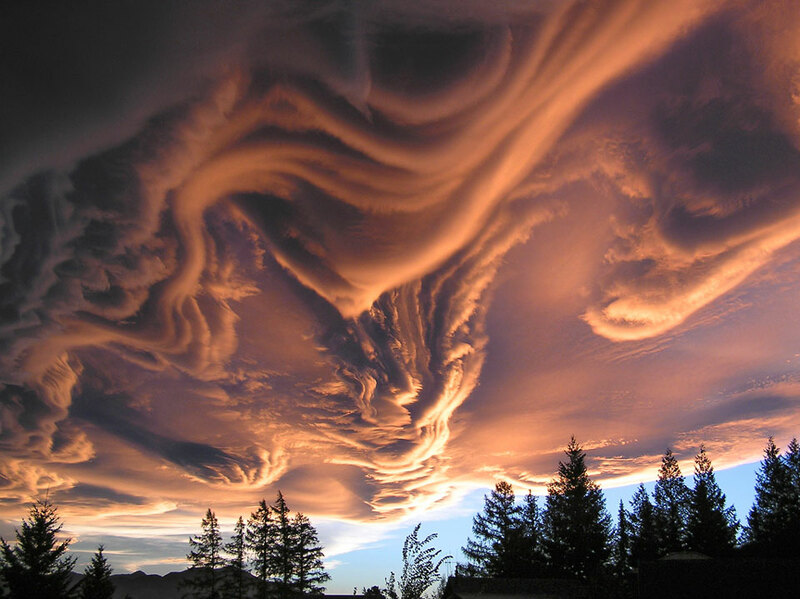 This Undulatus asperatus cloud shows features of lenticular activity that appear to merge into a larger stratus layer. The photo was taken in New Zealand, a country given the moniker “the land of the long white cloud” – another pointer to lenticular activities. This photo supports my belief that New Zealand is one of the most majestic and beautiful mountainous (and maritime) countries in the world. Thanks Richard for an extremely informative insight into clouds and some of your experiences, photos and explanations. Please keep posting this sort of information. Now I have a name for those winds that can sometimes make coming into/out of Adelaide interesting!! (Katabatic). On the subject of clouds, I noticed this in yesterday’s Astronomy Picture of the Day (a site well worth keeping an eye on for interesting images but I am biased as a physicist and astronomer myself). My compliments on this article on clouds. I learned things about virga and convective storms that I didn’t already know. Hi Richard, thanks for posting those images… particularly the T-storm over the Pacific. Do you use a polarisng filter to get that vivid colour and clarity, or just a standard Daylight (1A) filter? I can’t seem to get anything like that clarity in my air-to-air shots taken from the cabin. How I wish we passengers still had the occasional in-flight access to the flight deck. Fortunately my overseas business travel career began in the late-’70s. Hence I have some great memories of: middle of the night over the outback (Cathay B742); T/O from Cairns – unusually, to the north – (Qantas B742, VH-EBQ, now resident on display at Longreach, Queensland of course) and the sunrise just catching/illuminating the dome/stupa of the Golden Pagoda in Rangoon (SK DC-10) enroute to Bangkok. Congrats also on the best-seller status for the QF32 book, which I’ve just finished. Waiting for the answer to the final “cliff-hanger”, namely why you didn’t get a pass grade for the check flight. Surely that was a tongue-in-cheek result ?? I know the source is Wikipedia (probably enough said), but it looks like a Shelf Cloud to me, not a Roll Cloud. Yes John, you are correct. Roll and Shelf clouds are similar, but I have updated the images accordingly. I wish I had my own picture of a roll cloud, I have seen only a few, but in all cases I quickly turned and fled! Wonderful stuff, particularly the images. I refer you to the book, John Magee, The Poet Pilot written by Stephen Garnet and published by This England Book Cheltenham. ISBN 0 906324 22X (paperback) from which I have copied the poem. I committed this poem to memory and, in order to retain it, my pledge is to recite the full poem whenever the opening words come to mind. Poignantly, I was able to recite the poem, albeit somewhat misty-eyed, when my brother and I and some of our sons placed a memorial plaque on the remains of the No.10 Sqn RAAF Lincoln MR31 which still lies on Mount Superbus in south east Queensland, Australia in which our father perished while on a mercy flight at Easter 1955. Our dad, Sqn Leader Jack Finlay, quoted the opening lines of High Flight in an account of his entry into the RAAF in 1943. In 2005, I again recited the poem to the 200 or so people assembled at Emu Vale for the 50th Anniversary Memorial Service of the crash of the Lincoln. Peter thank you for your corrections that have been incorporated. I will purchase “John Magee, The Poet Pilot” as I am sure there are other pearls from his poetry. Beautiful photo, Richard. A true appreciation of the awesome power of nature. Scary memory – Early 90s – freshly minted Restricted Pilot’s Licence and going out to the Sydney training area, about 4 octas cloud. Glance to my left to see an Extra pop up through cloud vertically, stall turn and drop back through same cloud off my wing tip.